We adore chili in the fall and I’ll have this one on the menu as the months get cooler and the weeknights get busier! We love it because it’s hearty, it’s tasty and this one cooks itself all day! Keep it simple by warming up some diner rolls and steaming some broccoli. Easy, peasy weeknight supper awaits! This is also a great one to make ahead and get into the freezer! Chop the small white onion. Open the can of tomato sauce. Open, drain and rinse the cans of red kidney beans and black beans. In a large skillet, brown the ground beef with the chopped onion and minced garlic. Drain, if needed. To the slow cooker, add the browned ground beef with the red kidney beans, black beans, tomato sauce, salsa, beef broth, chili powder, and cumin. Stir it well and then set on low for 8 hours. Once cooked, season with salt and pepper to taste. 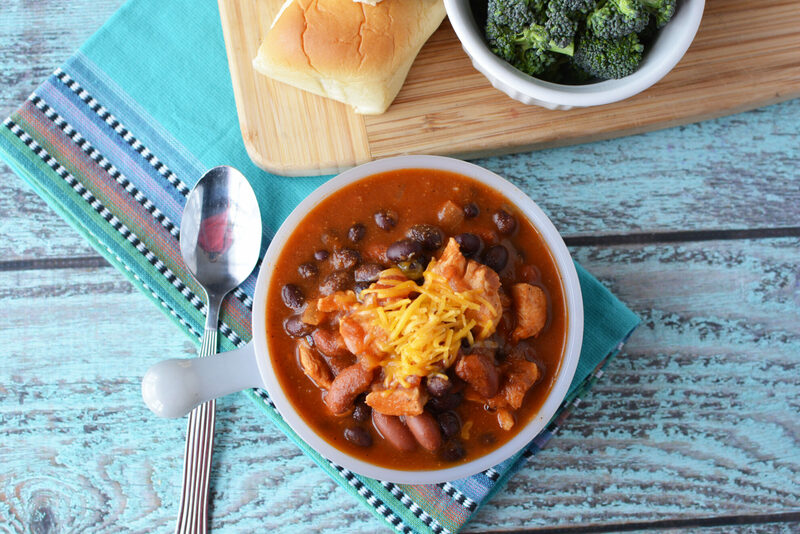 Serve Slow Cooker Cowboy Chili with shredded cheese garnish, and side of veggies and dinner rolls.